The table rate shipping plugin extends J2Store's default standard shipping options giving you highly customizable shipping options. Define multiple shipping rates based on location, price, weight, or item count. Add rules based on Weight, Number of items and price. 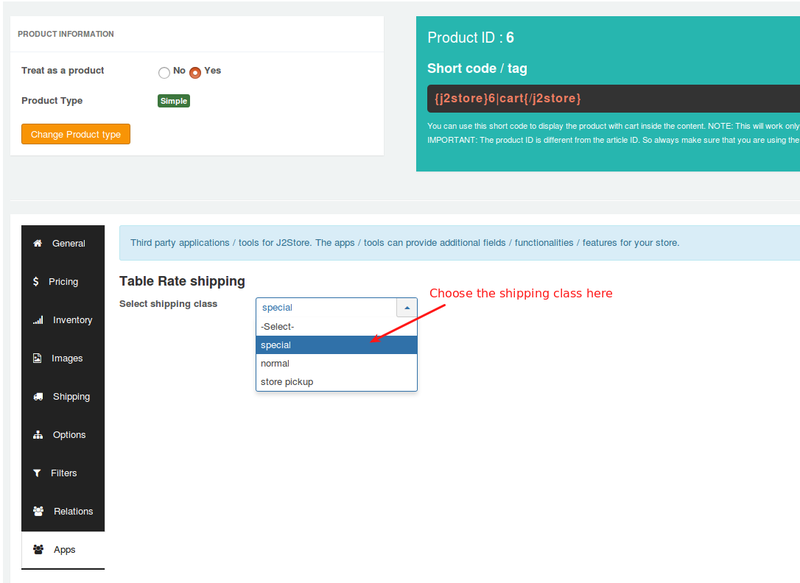 By using Table Rate Shipping it is possible for you to create complex rules for applying shipping cost. You can define multiple rates based on the customer's address, have multiple rates per zone, and add rules based on product weight, number of items, shipping class and price. Download Table rate shipping plugin from our site and install it via Joomla installer. After installing the package, go to J2Store > Setup > Shipping methods and enable Table Rate Shipping methods. Once activated, open the plugin and start configuring shipping method. When a customer checks out items in their cart, the plugin looks at the customer's destination (geozone) and then uses the table of rates you created to calculate total shipping. Each geozone can have its own rules, or multiple sets of rules, based on your shipping requirements. You have to create shipping zones and its rules for calculating the shipping correctly. Before start creating shipping method, you will have to select the weight unit globally. Handling cost is optional. 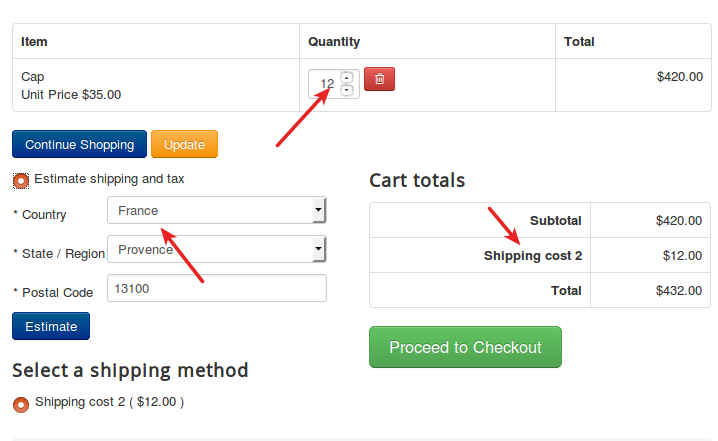 Navigate to Shipping rule tab and start creating shipping method by clicking on the button Add shipping button. You can assign the shipping method to multiple zones. So that the shipping cost will be calculated by checking customer's destination address. Do you have different price for different customers ? And also wants to define the shipping cost for different customers ? 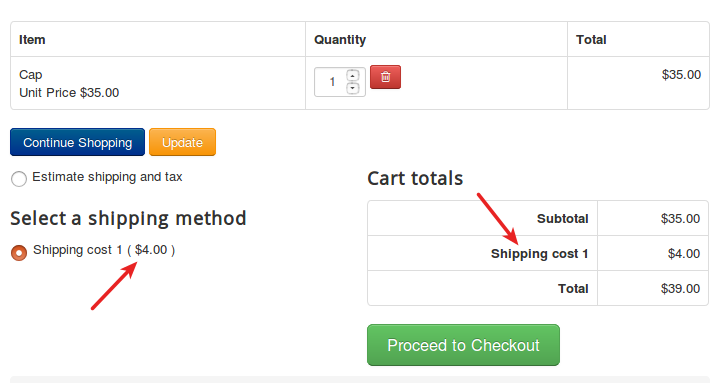 Its also possible with this advance shipping plugin. The shipping method can be assigned to single or multiple usre group so that the shipping cost will be applied to the customer who is associated with the user group selected here. If you would like to include tax to the shipping tax, you will have to select the tax profile here. 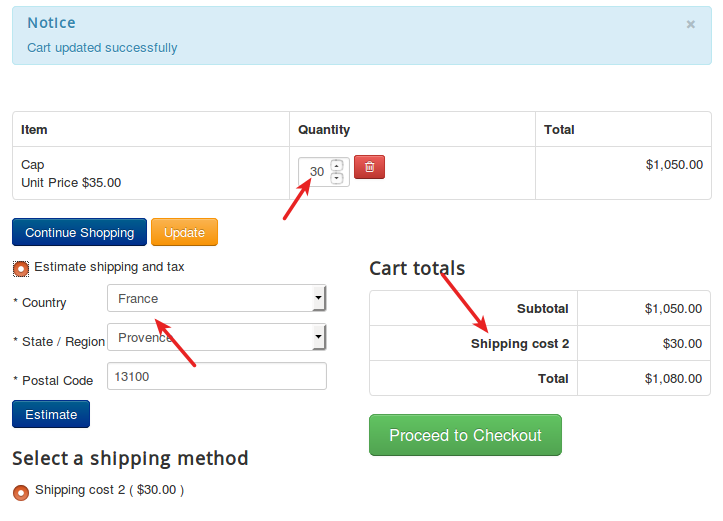 You can assign a maximum shipping cost to a method. For example, if the shipping total calculated is greater than the maximum cost, the price is decreased to maximum cost amount. Per order - This type of calculation method calculates the shipping cost for the entire cart. If there are multiple shipping costs in the cart, the class with the highest priority will be used. These can be set in the plugin that appears underneath the rate table when per order is selected. 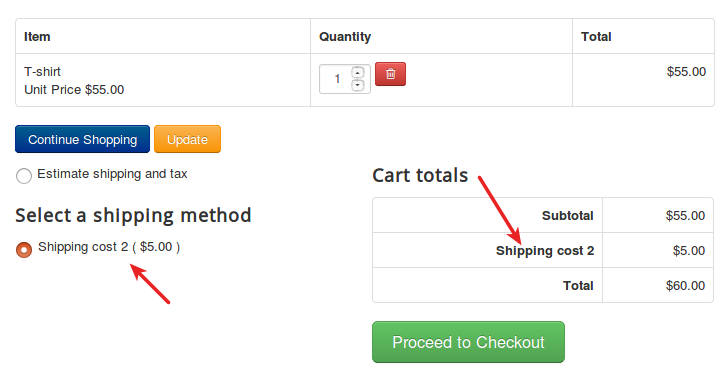 Per item - This type calculates the shipping cost by checking each item in the cart with the rates defined in the plugin. Ship class - Each shipping class in your cart is totaled and offered at a final rate. Apply a additional fee to the shipping cost calculated per item or per order or shipping class. Set a minimum cost to the calculated item. The item calculated could be an individual item or shipping class based on above settings. Set a maximum cost to the calculated item. The item calculated could be an individual item or shipping class based on above settings. 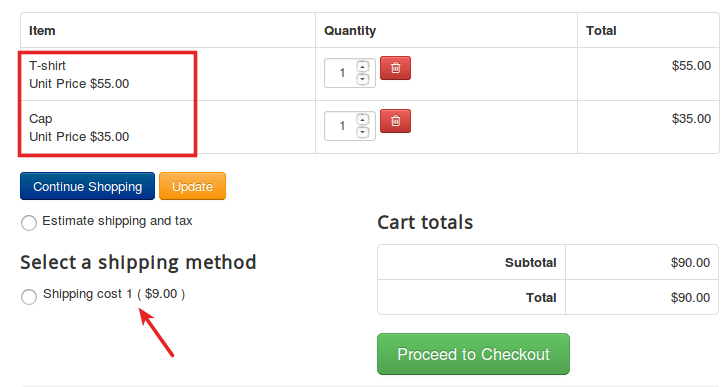 After filling all the fields on shipping method, click save and you will be asking to create shipping rule for the shipping method you created. Click on Add Rule button to create shipping rule. Shipping class - If you would like to calculate the shipping based on shipping class, then you will have to select the shipping class here. If you don't want to use shipping class, select No class. The minimum and maximum range should be given here for the chosen condition. For example, if you have chosen Item count as a condition, then you have to give the quantity range using these parameters. This option is used to stop calculating further shipping rates if you reach this row of the table. Enable this option to disable all rates or the shipping you are editing if the row you are editing matches any item/class being quoted. This is the base cost for shipping. This cost will be added to the shipping cost. Enter the cost per weight unit for the products. The percentage of the products total should used to calculate shipping. Shipping classes are used to restrict shipping by products. For example, you may have a product that weighs very large and needs special shipping price. In this case, you can use shipping class and create a shipping rule for that specific product. Multiple shipping classes can be created here. For example, special, normal, store pickup. You can create tables of rates that apply to different shipping classes. This gives you considerable flexibility when creating shipping methods. After creating shipping class, you will have to associate this shipping class to the product which needs special shipping charge. Create a geozone. If you wants to apply a shipping charge to the customers only from United States, then you will have to create a geozone for the country United States. Then, go inside the plugin and create a shipping method. Give a name for your shipping method and choose the geozone and user group. Choose Ship Class as your calculation type and save. (Note: You should have to create shipping class under the tab Shipping class). In this case, we are going to calculate the shipping based on the weight of the entire order so choose Per Order as the calculation type. He needs to create three rows, one for each rule he wishes to create. These will apply to any shipping class, with the weight condition, and a minimum and maximum weight applied. Consider that store owner would like to ship some of his products to Mumbai and some products to Delhi. Configuring this type of shipping cost could be achieved by using Shipping class. If customer adds both product A and B to cart so shipping charge of both should be summed and shown up because Product A ship from Mumbai and B from Delhi so user have to pay two shipping cost. Let me explain how to configure the table rate shipping based on above scenario. Since the products are going to be shipped from different places, the geozones have to be created separately. The below screenshot shows that we have created two geozones "Mumbai" and "Delhi". Then, assign the shipping class to the products accordingly. Cap - We considered that this product will be shipped from Mumbai. So we assigned the shipping class "Mumbai" to this product. If you edit the product and navigate to J2Store Cart tab > Apps tab, you would see the shipping class associated. T-shirt - and considered this will be shipped from Delhi so we assigned the shipping class "Delhi" to this product. We have created two shipping methods using table rate shipping plugin. Shipping cost 1 - This is to apply the shipping charge for the products to be shipped from Mumbai. Shipping cost 2 - This is to apply the shipping charge for the products to be shipped from Delhi. 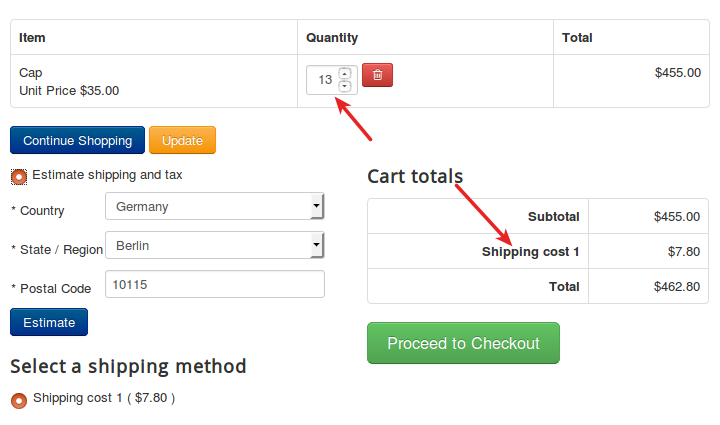 Now open the table rate shipping plugin and create the shipping method for Mumbai called "Shipping cost 1". Assign the geozone "Mumbai". Finally create the shipping rule using the shipping class. The shipping cost 2 has been created similar to the shipping cost 1. 2. Applying shipping charge based on location and quantity. Since the shipping cost are going to be calculated based on Germany and France, you will have to create two different geozones. Create a shipping method and give the name to it. For example, we named it as "Shipping cost 1"
Then, choose Germany to the Geozone and select the usergroups. Choose Per Order as a Calculation type and save. Similar to the above step, create a shipping method. Then, choose France to the geozone and save.